OMEGA is constantly striving to find new ways to increase the level of service available to our customers. To this end, OMEGA continues to expand the range of calibration services available, offering a broad selection of primary and secondary NIST traceable standards for use in calibrating temperature, infrared humidity, pressure, flow, and force products. By maintaining these standards in-house, we can ensure fast turnaround time on calibrations. All calibrations are performed by competent, trained technicians. Contact OMEGA’s Customer Service Department (0161 777 2225) to discuss your specific calibration requirements. OMEGA’s 15' High x 25' Long (5 x 8 Meter) recirculating temperature controlled wind tunnel is used in conjunction with NIST traceable air velocity standards to provide accurate flow calibrations. 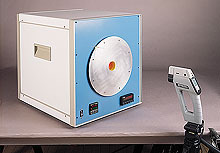 OMEGA’s in-house calibration standards include a complete line of blackbody calibrators for infrared pyrometer calibration. See Section K.